That idea – one of the fundamental principles used by textual critics throughout the 1800’s and 1900’s – was effectively erased by the data and analysis which was published by James Royse in 2010 in Scribal Habits in Early Greek New Testament Papyri. Royse observed that the rate at which the copyists of some early papyri made omissions is higher than the rate at which those copyists made additions; the ratio works out to about 3:2. This means that scribes were more prone to omit than to add. Griesbach had it backwards, and everyone who has relied on the validity of the axiom, “Prefer the shorter reading” has had it backwards – including Bruce Metzger. It shouldn’t have taken until 2010 for researchers to acknowledge that Griesbach’s claim was standing on thin ice. (And some already did; in each generation at least a few scholars maintained that the New Testament text’s transmission-history resembled the clothes in a traveling salesman’s suitcase, losing a sock at every hotel.) 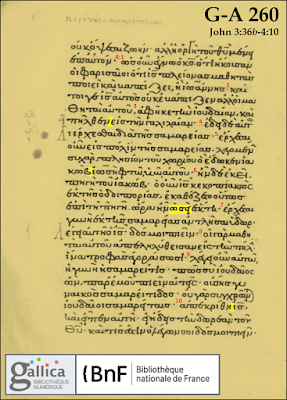 To researchers equipped with (mostly) accurate transcripts of Codices Alexandrinus, Vaticanus, Bezae, and Sinaiticus, it should have been clear that if the Byzantine Text originated as an amalgamation of Alexandrian and Western readings, its creators must have frequently rejected the readings in their exemplars. That is, one can believe Hort’s theory of the Lucianic recension, or one can believe that scribes using more than one exemplar typically expanded the text, but not both. The following readings, all taken from the first five chapters of the Gospel of John, demonstrate this with particular force. In each case, the Byzantine reading is shorter than a reading found in leading Alexandrian and/or Western witnesses. That’s 26 non-expansions in five chapters, an average of five non-expansions per chapter. Extrapolating, we might find over 100 such non-expansions in the entire text of John, and over 400 such non-expansions in all four Gospels. (In addition, one might profit from considering all the Byzantine readings that are not significantly longer than their Alexandrian and Western rivals, but are simply different – variants such as the reading ὡσεὶ (instead of ὡς) in John 4:7, and the transposition at the end of John 4:20, and the reading Βηθεσδὰ in John 5:2 (where Vaticanus reads Βηθσαιδὰ, Sinaiticus reads Βηθζαθὰ, and D reads Βελζεθὰ). How can one say that the Alexandrian and Western readings in the listed passages have not been thrown out? And how can the Byzantine Text, at these points, be considered derivative of text-forms whose readings are rejected? Hort’s eight conflations have been used as proof that Byzantine scribes applied the principle, “If in doubt, don’t throw it out.” Meanwhile, a tour through just the first five chapters of John reveals three times as many instances where, if Byzantine copyists accessed Alexandrian and Western exemplars (as advocates of the Lucianic recension believe that they did) – they must have thrown out Alexandrian or Western readings. This does not mean that as more and more non-Byzantine manuscripts (with non-Byzantine readings) were encountered in the areas now known as Syria, Turkey, Cyprus, and Greece in the 300’s, they had no effect whatsoever on the local text. This data does not refute the idea that in some passages of the Byzantine Text (I am thinking specifically of some of Hort’s alleged conflations), an early local reading, which once agreed exclusively with either the Alexandrian or Western reading, has been completely supplanted by an expansion that was elicited by the arrival, from another locale, of an attractive rival reading. (Something similar happened occasionally in the Alexandrian transmission-stream, as Wilbur Pickering has demonstrated; see, for examples, Mark 1:28, John 7:39, Ephesians 2:5, and Colossians 1:12.) But it does imply that to describe Byzantine scribes as if they never met an expansion they didn’t like is to spread an essentially false characterization. The evidence supports instead the position that the typical attitude of Byzantine scribes, when and where they encountered unfamiliar readings from non-local exemplars, was one of caution: “If in doubt, sort it out.” Otherwise these 26 short Byzantine readings in John chapters 1-5 would be longer. 1. "the claim made by J. J. Griesbach over 200 years ago:" the quote that follows is not on the page that pops up when the link is clicked. 2. "Byzantine reading is shorter than a reading found in leading Alexandrian and/or Western witnesses" What would these witnesses be--the Four Old Uncials mentioned? "Neither the shorter nor longer reading is to be preferred" - Robinson, "The Case for Byzantine Priority", internal criterion #8, with further extended discussion. RP2005, pp.552-554. Once again we must check our facts before we make a statement as a fact. Surely, Dr. R. is correct, as usual, particularly in light of the studies on scribal habits. A fault in previous articulation of this canon was the belief that scribes were not human, that they didn’t suffer from individual tendencies. Yes, we can see where copies of a common exemplar have incorporated preceding errors, but we now know many early omissions, like above, may have resulted from an individual scribes tendencies. You can see this understanding being fleshed out in the THGNT, particularly in Mark, where the editors have chosen the longer reading when 01 & 03 together and mostly in isolation omit.